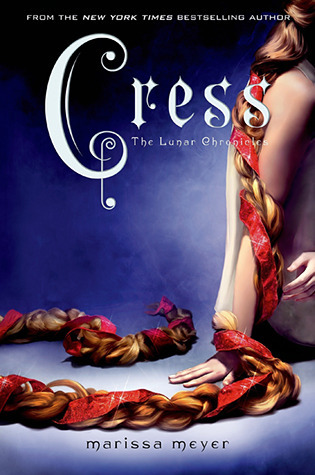 Cress by Marissa Meyer is the latest in her Lunar Chronicles. The series gives new life to my favorite fairy tales, plus the added bonus of a science fiction spin to them. Cress is Lunar, but she is a shell. For the last seven years of her life, she has been trapped on a satellite orbiting Earth. She was placed there with Mistress Sybil Mira, who is Queen Levana's head thaumaturge. She is an excellent hacker, and was in fact, the girl who warned Cinder of Levana's plans to kill Emperor Kai in the first book. Cinder, Thorne, Scarlet, and Wolf make contact with Cress, and decided to rescue her from her imprisonment. Too bad that rescue goes so horribly wrong. The group ends up split up. They must find a way to survive, to stop Kai and Levana's wedding, and ulimately put an end to Levana's reign over Luna. The Lunar Chronicles is one of my favorite series, and it is not even finished. There is so much to love about this series, it is hard to know where to start. I suppose the beginning is a very good place to start, so we will begin with the cover. How fantastic is the cover art for Cress? There is a simple understated to elegance to just demands for the book to be read, and when you do read the book, you will not be disappointed. I simply adore the way that Ms. Meyer is able to keep key elements of the original fairy tale, and still make the story totally her own, and fresh to the reader. Things like the Sybil's imprisonment of Cress, Cress long hair, or even (Slight spoiler) Thorne's blindness. In this book you get not only to meet the amazing Cress, but a more extensive picture of Carswell Thorne. My copy even had the bonus short story, Carswell's Guide to Being Lucky, where we get a story of Thorne in high school, and what lead to the fight incident mentioned several times during Cress. There is even the introduction to Princess Winter, Levana's stepdaughter, and the subject of the next book in the series. Which I cannot wait to read already. I do have to mention that possibly my favorite seen came between the two most unlikely of characters interacting, Cress and Wolf. When Cress ask Wolf about Scarlet, and he calls her his Alpha to which she replies like the Alpha Star which is the guiding star. He answer of yes, made me love him all the more. It is quite possible that Scarlet and Wolf are my favorite pair of the series. If you have not started reading The Lunar Chronicles, what in the world are you waiting for? It has all anyone could ask for adventure, romance, intrigue, and plus cyborgs, aliens, and animal hybrids.